Okay, I will be the first to admit that this example breaks many of the basic rules for a proper lowercase L sighting, particularly the requirement for most or all the other letters to be uppercase. Still, I felt this 7th Avenue sign for "Black Plum" deserved some recognition, because even though the words consist almost entirely of lowercase letters, the L's strangely have been written to look like i's. This is because the writer has chosen to limit the height of the lowercase L, which would normally ascend above most other lowercase letters (like u, m, a, c), to equal the height of all the letters in the word. 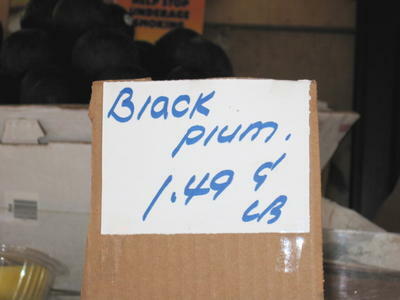 So we end up with a sign that looks like Biack pium is selling for $1.49/LB. Also of note, the writer apparently has no aversion to using uppercase L's, as is evident in LB. Hmmm. I'm not sure you are correct here, Lowercase L-er. I think the only uppercase letter here is the "B". In your haste to find lowercase L's you have been deceived by what you thought was an uppercase "K" but is in fact a lowercase "k" with a very short stem. Look again. I see "Black plum". Paul, in your haste to point out my haste, you missed my point: "[..] even thought the words consist almost entirely of lowercase letters, the L's strangely have been written to look like i's." Like I said, this example is more about the height of the lowercase L's compared to the rest of the letters in the word. Usually the top of a lowercase L would be higher. Here they just looks like un-dotted i's. To say "[..] even though the words consist almost entirely of lowercase letters, the L's strangely have been written to look like i's." is misleading. All of the letters are lowercase except the first one--the "B". Every remaining letter in "Black plums" is in the lowercase in this sign. I agree that the top of the lowercase "l" should be higher, but that does not make it a mistaken lowercase l. In fact, it fits a pattern considering the lowercase "k" is written the same. This is not a case of a lowercase l. You have been duped! A short lowercase "K" -- or any other lowercase letter, for that matter -- cannot be mistaken for another letter like the lowercase "L" can. That is the gist of this post ... the short lowercase L looks like an undotted "i".